A HELOC (home equity line of credit) is a revolving line of credit issued by a lender based on the equity available in the home. Just like a home equity loan, the home equity line of credit uses the borrowers home as collateral. Unlike a home equity loan, the HELOC allows the borrower to use and pay back money as needed up to the credit limit for the term of the line of credit. For a more detailed description of a HELOC please read our blog post What is a HELOC? Because the interest rates on a HELOC are lower than most credit cards, the use of a HELOC to finance debt can be very compelling. However, unlike credit cards, if you default on your HELOC you could put your home at risk for foreclosure. 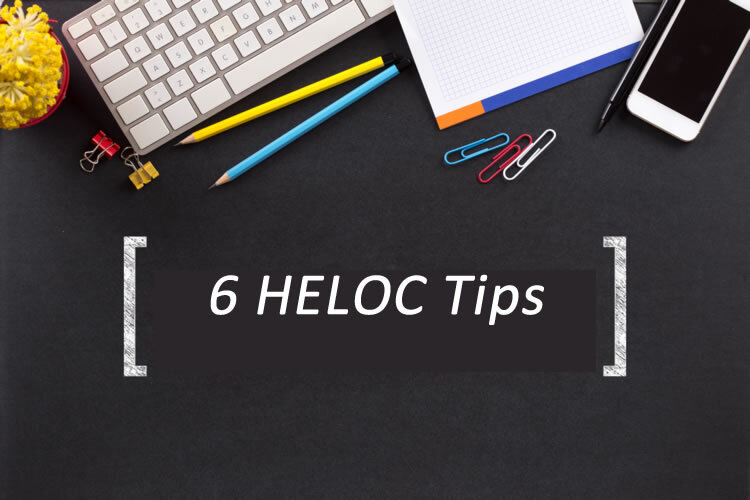 Here are 6 HELOC tips to help you get your HELOC to work to your advantage and help avoid putting your home or your financial security at risk. Before you begin looking for a lender to give you a home equity line of credit you should decide how you intend to use the line of credit they give you. Understanding how you are going to use the line of credit will help you evaluate the options that lenders give you. For example, if you need the HELOC to cover a short term expense that you anticipate paying off within a year or two then you will want to make sure the lender doesn’t charge prepayment penalties. Or, if you have a very tight budget that will only allow you to pay a certain amount per month on the loan then you want to ensure that the interest payments cannot exceed that amount. Once you determine what you intend to use the home equity line of credit for, make sure to only borrow what you need. If you have a lot of equity in your home you may be tempted to borrow more than you need. This can quickly become a dangerous situation if you begin using the line of credit to spend more than you can afford. When the HELOC becomes due you may find yourself in a debt crises that seriously impacts your financial well being. It may seem easy to go to your bank and apply for a HELOC, after all you have an existing relationship and it may feel safer to work with a financial institution you already know. However, your bank may not provide the best HELOC terms for your specific situation. If you have identified how you are going to use the HELOC, your ability to evaluate various lenders will be much easier. It will also help the lender to understand how best to structure the HELOC so that it meets your needs without putting you or the lender in a high risk situation. If the lender presents the terms of the HELOC and it does not support your goals, continue looking for other lenders until you find one that works for you. If you think you might want to refinance your first mortgage during the time you will have a HELOC, consider pursuing a refinance first. A HELOC is considered a type of loan so the credit limit of your HELOC will be considered as a loan against your home. The HELOC loan will be used as part of the lender’s loan-to-value ratio calculation to determine whether to approve a refinance and what the terms of the refinance will be. Make sure you fully understand the interest rates of your HELOC. If you are offered an introductory rate ask how long the introductory rate lasts and what the interest rate will be after the introductory period is over. The lender should also let you know if there is a cap to how high the interest rate can go during the life of the HELOC. If there isn’t a cap, look for other lenders that will give you one. And, when you are evaluating whether you can afford the HELOC being offered, consider whether you would be able to make at least the minimum payments if the interest rate was at the highest rate it can go. Most HELOCs only require you to pay the interest charges during the length of the term. This may sound enticing but when the HELOC term is reached you may find your minimum monthly payments so high that you simply can’t afford to pay them substantially increasing your risk of default. HELOCs can be a great way to help finance expenses and protect yourself in case of emergencies as long as you consider the tips above and use the line of credit wisely.